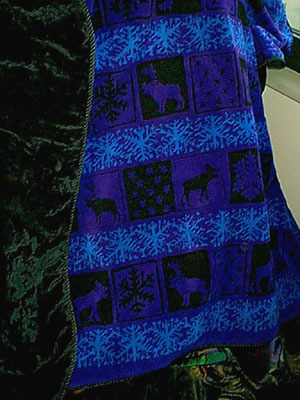 Winter Wonderland is a polar fleece print in electric blue, purple and black with reindeer figures and snowflakes. The lap robe is lined with black faux fur. In a lightweight version, the polar fleece is combined with light blue satin. 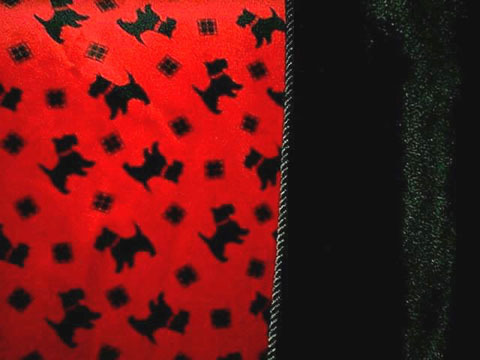 Scotties has a rich red velvet front with a delightful all-over pattern of black Scotties. It is backed with black faux fur. 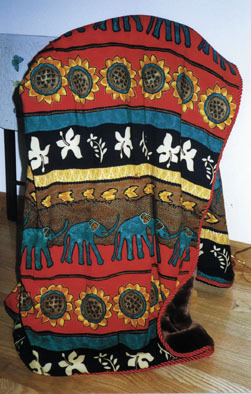 Kingdom of the Elephants has a colorful rayon print of a procession of elephants and decorative motifs from India. It is backed with soft, brown faux fur.